This is a very competent, practical compact luxury car. It rides highish off the ground so farm roads are a doddle. You also sit more upright and higher, giving excellent visibility. Performance is between good and excellent. Handling and roadholding match the class leaders in this crossover SUV niche. Mercedes replaced the old A Class with 3 models. A sporty range called the CLA, the normal one called the A and a cross-over that superficially looks like the A, the GLA. The GLA rides higher than the A and is a little bigger all round. Many will feel this is the most practical new baby Benz. There are two petro and two diesel models, three style lines and three add on packages. The 200 is a 1.6 petrol engine with electronically controlled direct petrol injection through piezo injectors and a turbocharger. 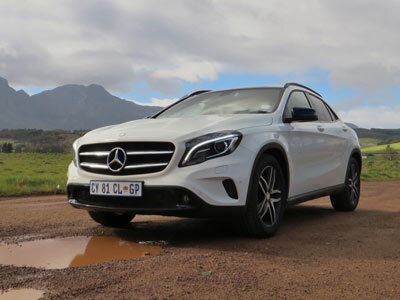 Claimed fuel consumption is 6 litres/100km, but expect around a still exceptional 7. The 250 4matic has a 1.9 engine, more performance and is a little thirstier but still very good. The 200 CDi is a 2.1 litre turbodiesel with high-pressure fuel injection common-rail technology, VTG turbocharger and EDC. The 220 CDi is the same engine but with more punch. Claimed diesel consumption is 4.5 to 5 l/100km. Aim for 6, but be easy on the throttle. 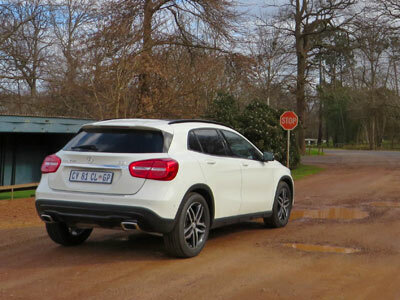 The GLA comes in a choice of three lines “Style”, “Urban” and “AMG Line” . Amongst the many optional extras to choose from, are the large panoramic sliding sunroof, or the EASY-PACK tailgate, which can be opened and closed at the push of a button. Standard equipment includes multifunction steering wheel, eco start/stop, Collision prevention assist, which warns the driver visually and audibly of insufficient distance to the vehicle travelling ahead or of stationary objects, attention assist, cruise control, climate control, automatic lights and adaptive brakes. In addition there are three style packages: Night, Exclusive and AMG Exclusive. Highlights of the Exclusive package, for example, (available for all three lines) include heated sports seats with 4-way lumbar support for driver and front passenger, leather-covered, like the multifunction steering wheel and the gearshift lever. It is all a little confusing and almost too much for me. In the showroom it is a little easier to get you head round the choices, but beware, costs mount rapidly. I liked the car. I think Mercedes mostly got it right and it does feel like a baby Benz. 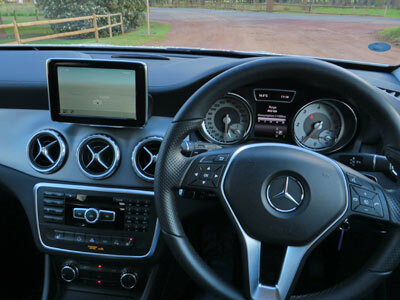 The interior, apart from the protruding multimedia screen, is very pleasant and has enough space for a smaller car. If you prefer a hatch type shape of car and a little more ride height MB have got it right with this car. Not cheap though. Also look at the Audi Q3, BMW X1, Nissan Qashqai, Subaru XV, Volvo V40 Cross Country and Ford Kuga. As tested R422 700 plus options R120 450 for a total of R543 150. Options are reversing camera, active park assist, paoramic sunroof, 7G-DCT automatic box, COMMAND online, tow-hook, Bi-Xenon headlamps, easy pack tailgate, Exclusive package, mirrors, night pack and urban line. The range starts at R421 800, and goes to R760 800 for the GL45 AMG. We would recommend the G LA200 Auto at R461 947. Two formidable competitors stand out. The Ford Kuga 2.0TDCi AWD Titanium is R448 900 fully and comprehensively equipped. The Volvo V40 Cross CountryD4 Excell at R395 000 is a complete package. All GLA models come standard with a 6-years/100 000 km maintenance contract and two year unlimited warranty. 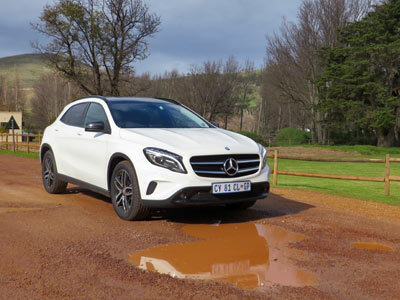 This entry was posted in Reviews and tagged 2014, automatic, crossover, diesel, Mercedes-Benz, Review, South Africa, SUV, turbo. Bookmark the permalink.